The Swift wasn't born in 2005. It was inspired, from some of the world's most famous performance machines. Like the Suzuki Hayabusa 1300R, created as the world's fastest production motorcycle. It had an uncommon evolution. From the first concept car, the GSX R4- to the Concept S, then the Concept S2, a disruptive open-top convertible, to the global launch of the radically-styled Swift. What followed were numerous awards, accolades and a huge club of die-hard fans. The Swift was applauded by one and all. Now, after six years at the top, it's time to take this passion to a whole new level. One can't have enough of the Swift. Of its unique charisma that's led to a passionate fan following. And every little change and improvement in the New Swift that makes it unmistakably more Swift. It has more attitude, more style, more sportiness, more performance and it's more premium. Its form and feel inspire even more passion and excitement. Even before you get behind the wheel, you'll agree the New Swift is 'More Swift' than ever before. Just so many more reasons to join the Swift fan club. . In true sports-car style, the Swift's glasshouse cabin wraps around the driver for a more interactive experience with the knobs and instruments. 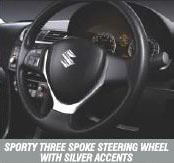 Sporty touches abound, with a three-spoke steering wheel and a spherical shift knob. Sit back and you realize how the long wheelbase and overall width make for unbeatable levels of roominess for front and rear-seat occupants. While ergonomically-designed seats with a deep base provide unmatched under-thigh support. So, no matter how long the journey, you drive relaxed. Built to save lives. And odds and ends. Since your peace of mind is high-priority, we've surrounded you with the latest technology so you can rest assured. Knowing that a highly crashworthy structure keeps you secure in collisions. As do other efficient, impact-resisting features like a collapsible steering column, front seatbelt pre-tensioners with load limiters, and energy absorbing trim. Active-safety technologies like dual front airbags, antilock braking (ABS) with electronic brake-force distribution (EBD) in the ZXi, and a brake-assist function across the range, minimize driving hazards. This sensible, reassuring approach also manifests itself in the way space is managed so as to maximize people and luggage carrying flexibility. Bench-type rear seating allows three to sit comfortably. Storage spaces let you tuck things away in corners. And there's a large boot, with generous amounts of space. The Swift is designed to respond to your littlest needs even as you drive it. No less than 6 on-board computers optimize performance and drive quality as driving conditions change. To let the engine efficiently harness 87bhp (at 6000rpm) and a maximum torque of 114Nm (at 4000rpm). The 1.3 liter, A1Tec32 engine is tuned for better performance at low and mid-range speeds, crucial for efficiency in stop-and-start urban driving, and even on winding country roads. • Sporty, Well-Integrated Look. Wide rear bumper. Styled tailgate. Curvy, rear combination lamps flush with the chiseled shoulder lines. Looks loaded. • Strong Underbody Structure. Lets the suspension and steering systems work to their full potential so you get a more refined ride. • Class-Widest Tracks (Front: 1485 mm, rear: 1495 mm) allow spacious interiors, ride comfort, better on-road handling and stability. Previously unfelt. • Advanced P-EPS Steering provides more assist, reduces cabin noise and aids fuel-efficiency. • Automatic climate control system (in ZXi variant) enhances cabin comfort. On-board computers auto-adjust to the weather for comfortable, constant cabin temperature. • Optimal driving position. Easy 35mm height adjustment (in ZXi variant). 240mm fore-aft slide range. At your service. • Pleasure-plus transmission. 5-speed manual gearbox with cable-shift mechanism features an updated short stroke design for a firmer, quick shift. • On collision, no impact. Dual front airbags deploy in an instant to shield you from harm. • No key no problem. An ultra-modern, remote keyless entry system* ensures only you can enter. Girlfriend - proof. Dad - proof. Over - friendly - neighbor - proof. And oh yes, crook - proof. • Pack to capacity. The boot accommodates plenty. Perfect for those out-of-town, weekend trips. • Shift it here. For everything that you can remember, and for all that you can't space enough. • Bad roads, here we come. MacPherson struts attach the suspension arms, steering, gearbox and rear engine mounting to a suspension frame, not the body, raising handling and comfort to a new high. • The new torsion-beam suspension in the rear keeps unsprung weight low. Good control of camber angle and toe-in makes for predictable handling. The DDiS engine has won the ‘International Engine of the Year Award*’ in Europe. DDiS is the superior Common Rail Direct Injection Technology that powers Maruti Swift Diesel. This future-ready engine is highly compact and incredibly fuel efficient. It is the lightest engine in its segment*, generates a class beating 190 Nm of torque and has an amazing power of 75 BHP for a superior drive. This refined engine is the first in India# to have a 5 Step Multi Injection Technology for smoother running, low noise and cleaner exhaust. It is perfect both for city and highway driving. This next generation DDiS engine has a 16 valve cylinder head for more power and higher engine response leading to a smoother ride. It boasts of a combination of Turbocharger and Intercooler for high performance. It has Double Over Head Camshaft (DOHC) for precise control of valves - another first that delivers better fuel efficiency. It is the only engine with a Chain Drive Timing System, which is maintenance-free for the entire life of the engine. It is a compact, light-weight and refined engine with an Aluminum Bed Plate to ensure low noise and vibration. The combination of a 16 valve cylinder head and a 5 Step Multi Injection System gives efficient combustion leading to cleaner emissions.